The VHS videocassette format is introduced as Vidstar in North America at a press conference before the Consumer Electronics Show starts in Chicago. 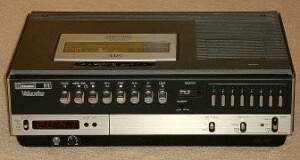 VHS, or Video Home System, was based on an open standard developed by JVC in 1976. As compared to the Sony Betamax format it would compete against, VHS allowed longer playtime, faster rewinding, and fast-forwarding.